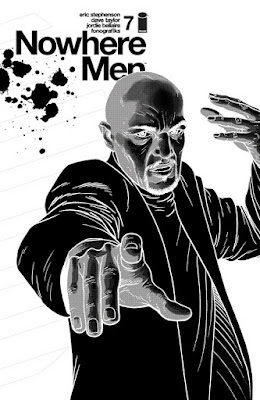 The bestselling, cult-hit NOWHERE MEN by writer and Publisher at Image Comics, Eric Stephenson, new series artist Dave Taylor, Eisner-award winning colorist Jordie Bellaire, and Fonografiks jump-started the highly anticipated second story arc to early critical-acclaim and fan enthusiasm. NOWHERE MEN #7 is being fast-tracked to a second printing in order to keep up with customer demand. NOWHERE MEN #7 begins up where NOWHERE MEN, VOL. 1’s cliffhanger ending left off and opens with PLUTONA artist Emi Lenox’s rendering of a sequence plucked from the sketch diary of Emerson Strange’s daughter. NOWHERE MEN #7 remains available for purchase across all digital platforms, including the Image Comics website (imagecomics.com), the official Image Comics iOS app, ComiXology’s website (comixology.com), iOS, Android, and Google Play. NOWHERE MEN #7, 2nd printing arrives in stores on Wednesday, February 3rd, 2016 and can be pre-ordered with Diamond Code DEC158647. NOWHERE MEN #8 hits stands on Wednesday, February 24th, 2016 and can be ordered with Diamond Code DEC150601.